China’s foreign investment into Africa has been generating a great deal of controversy. Some argue that China is becoming the new colonial power over Africa, others see China as a key source of foreign exchange that may finally help spur long-run economic growth in Africa. 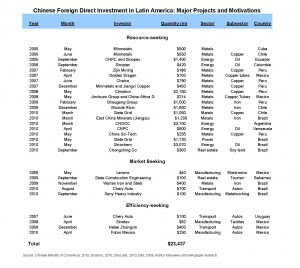 There has been relatively less discussion about China’s investment in Latin America, because it was thought that there was so little of it. A closer look reveals that Chinese FDI is larger than previously thought, and growing fast. According to official Chinese statistics, foreign direct investment (FDI) to Latin America has been relatively limited—averaging just over $4 billion per year between 2003 and 2009. That is 3-4 percent of total FDI into the region over the same period. What is more, according to China, 96.7 percent of all Chinese FDI into Latin America during that period went to the Cayman Islands or the British Virgin Islands—two countries that would sink into the ocean if they had $3 billion per year in such investment. Peal away these two financial havens and the Latin American region only received about $126 million in Chinese FDI, or less than 1 percent of the annual total. 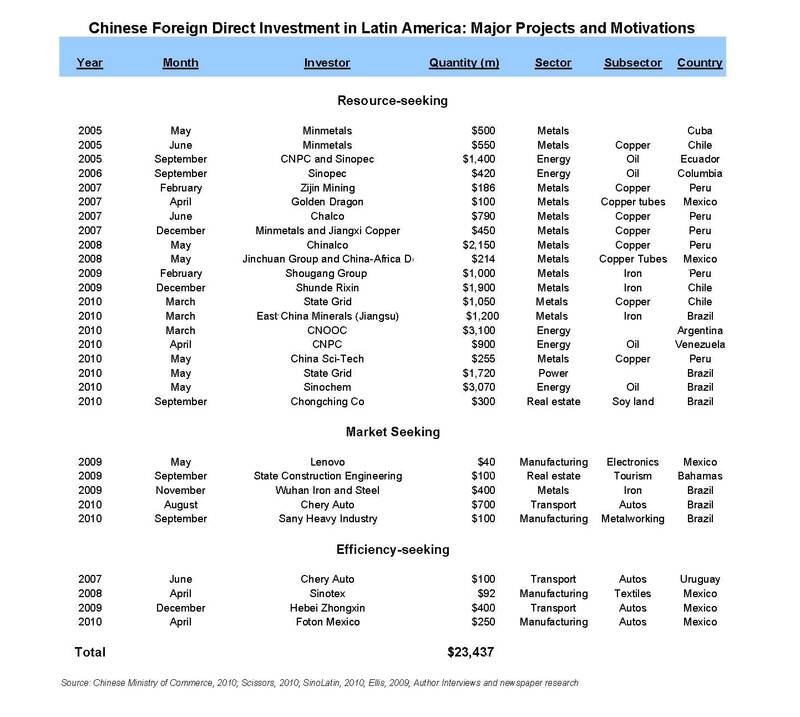 Nothing worth investigating—if it wasn’t for the increasing concern or fanfare about Chinese FDI from Latin Americans. In response to cheer and outcry, think-tanks, venture capital firms, journalists, and academics like myself have been trying to piece together how much Chinese FDI really does flow to the region. The table below from a forthcoming paper I am working on exhibits just some of the largest projects in Latin America (those over $100 million) to reveal that FDI from China to Latin America is indeed approximately closer to the figures for total FDI into the region reported by China, at around $4 billion per year, but the composition of that investment is far from simply in tax havens. As the accompanying table exhibits, China is largely pursuing investment in primary products such as iron, copper, and soybeans. Indeed, in my forthcoming book with Roberto Porzecanski titled The Dragon in the Room: China and the Future of Latin American Industrialization, we calculate that Latin America accounts for more than one quarter of all China’s imports of primary products, more than any single region. It should thus come as no surprise that the main determinant of Chinese FDI into the region is the fact that Latin America has location-specific assets—natural resources. In addition to being “resource seeking,” albeit to a lesser extent, Chinese FDI into the region is also “market-seeking” and “efficiency seeking.” Chinese steel makers and auto companies such as Chery Auto have invested in Brazil in order to serve Brazil’s large market. Chinese auto firms and electronics have also located in Uruguay and Mexico to seek “efficiency”—or to serve as export platforms to larger markets, namely Brazil (Uruguay) and the United States (Mexico). Latin America is in desperate need of investment. Total investment as a percent of GDP for the region is less than 20 percent per annum, much less than the suggested 25 percent by the Growth Commission and levels over 35 percent across East Asia. It is also established that the FDI that LAC has received over the past twenty-years has had a very limited impact in the region. I co-chaired a multi-year effort where numerous economists from across Latin America examined the economic, social, and environmental impacts of foreign investment. We summarized our findings in a 2009 book titled Re-thinking Foreign Investment for Sustainable Development: Lessons from Latin America. As we found in our book, developed country FDI tends not to contribute to economic growth, employment, or innovation, and often is no more apt to comply to environmental standards than domestic firms are. Will Chinese FDI behave differently than FDI largely of Western origin? It is too early to tell whether Chinese FDI into Latin America will be a blessing or curse. For now at least we are beginning to understand the magnitude and true composition of China’s economic reach in Latin America.